Stay in a boutique hotel nestled at the foot of the stunning Virunga Mountains. Discover a different, darker side to the country at the Kigali Genocide Memorial Centre – a place to learn about and reflect on the atrocities the Rwandan people faced in the mid-90s..
Stay in the small Rwandan town of Ruhengeri. Hike through Rwanda's dense steamy jungles in Volcanoes National Park. Fall in love with the gentle nature of mountain gorillas for one intimate hour. Admire a family of mountain gorillas in their natural habitat..
Trek to see chimpanzees in Uganda..
Keep your eyes peeled for the plentiful elephant and hippo populations in Queen Elizabeth National Park. It’s currently low season in Rwanda. Prices are good, and Rwanda's attractions aren’t crowded. With gorilla permits included in the price of the trip, seek out the rare mountain gorilla on a trek through Uganda's steamy forests and spend an unforgettable hour in their presence.. Learn about Rwanda's devastating history with visits to different genocide museums and churches of significance. Spend two nights in beautiful Gisenyi at a resort on the north shore of Lake Kivu. Learn about Rwanda's somber past at the Genocide Memorial..
Look out for gorillas during guided treks..
Meet with scientists at the Karisoke Research Center..
Spot the Big Five in the world famous Serengeti National Park. Trek to see the Mountain Gorillas in Bwindi Impenetrable Forest or Mgahinga National Park in Uganda. Encounter a great variety of wildlife in the World Heritage listed Ngorongoro Crater. Have your bases covered with all national park and permit fees for gorilla trekking included..
Visit the Genocide Memorial in Kigali..
Rwanda is a landlocked Central African country that prides on endless hills, jungles and bamboo forests. Also known as “Land of a Thousand Hills”, this charming country is an ideal destination for eco tourism. Tourists come here to track gorillas and other types of apes in national parks. 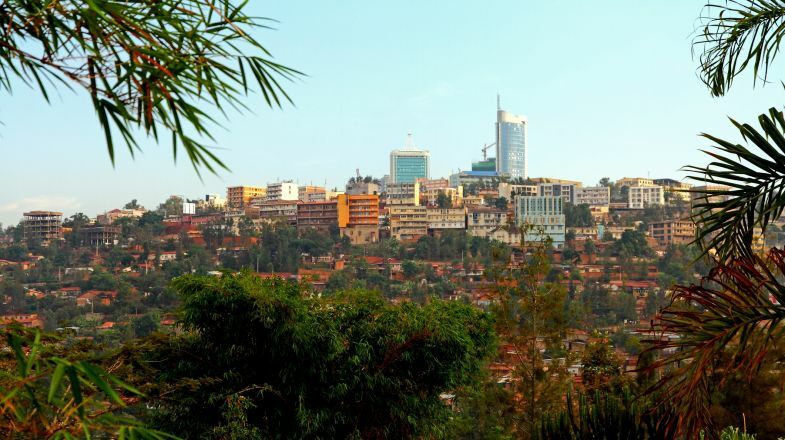 However, you will also find Kigali, the capital city, and Lake Kivu desirable places for a visit when a trip to Rwanda. Finally, Rwanda managed to emerge from its dark past and today, it is one of the safest African countries. Spend some time in Kigali, enjoy its relaxed vibe and take a walk along impeccably clean streets. Pay respects to the 1994 victims at the Kigali Genocide Memorial Center. Come to Rwanda in July to attend the celebrated Rwanda Film Festival throughout the country. Take a tour of Volcanoes National Park to see protected mountain gorillas. At lower altitudes of the park, you can observe golden monkeys. Discover Nyungwe, a large rainforest inhabited by rare bird, orchid and monkey species. Take a 50-meter high swaying walking path to experience marvelous views and increase chances to see birds and apes. Visit Akagera National Park and see lions, leopards, giraffes and hippos among other wildlife. Go to Butare (Huye) and examine the outstanding ethnographic collection in the National Museum. Unwind on Lake Kivu’s beaches and hills overgrown with pine and eucalyptus trees. Residents of Rwanda are very hospitable and forthcoming toward tourists. More so, they will impress you with their friendliness. While, Rwanda is a safe country, watch out for overcharging and petty thefts. To withdraw money, you can use ATMs in banks in major towns. Rwanda is a cash-oriented society and credit cards aren’t widely accepted. Some hotels and safari providers accept USD. Internet access is available in most cities, but it tends to be slow and unreliable at times. You should manage well on a Rwanda tour with English and French. Visit a doctor before you go to Rwanda to get medical advice.